Current day Tollefson Plaza overlooks the place where the Prairie Line of the Union Pacific Rail Railroad and the Great Northern Railroad turned east and crossed over Pacific Avenue to meet Puget Sound. Yet the line, which carried rail cars of passengers and freight to, from, and through local communities, is no longer visible. The connection between Tacoma, the railroad, and local communities is not reflected at Tollefson Plaza today. “Link” makes visible the connection between the rail lines and highlights that the Prairie Line linked communities together and to the water. Rails will be suggested with the application of 3” wide black duct tape on the ground, beginning at the corner of 17th and Pacific. The distance between the “rails” will begin at approx. 4 feet, then veer apart, one going in the direction of an installation we place in the fountain, the other in the direction of the visible tracks at Hood St. 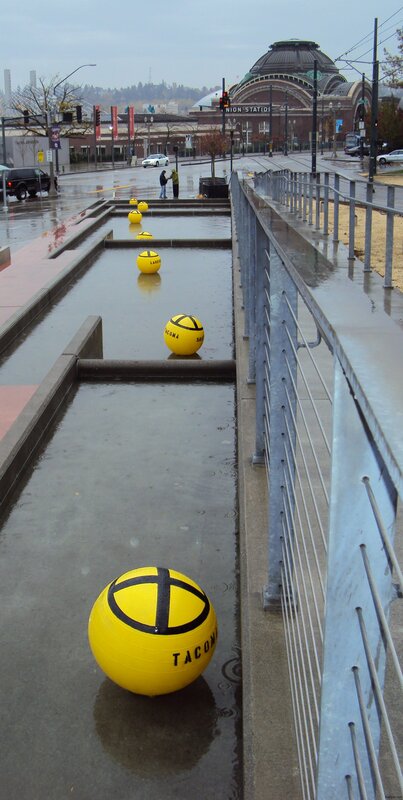 In the southernmost segment of the Tollefson Plaza fountain, a connection of disks, representing iconic yellow and black railroad signs will float along with linked letters stating the names of Prairie Line community stations: Tenino, McIntosh, Wetico, Rainier, Yelm, Roy, Hillhurst, Lakeview, South Tacoma, Tacoma 15th Street Tower. The placement of the signs in the water echoes these communities’ link to each other and the water via the Prairie Line. The disks will float, yet be weighted down in order to allow, yet limit, movement in the water. 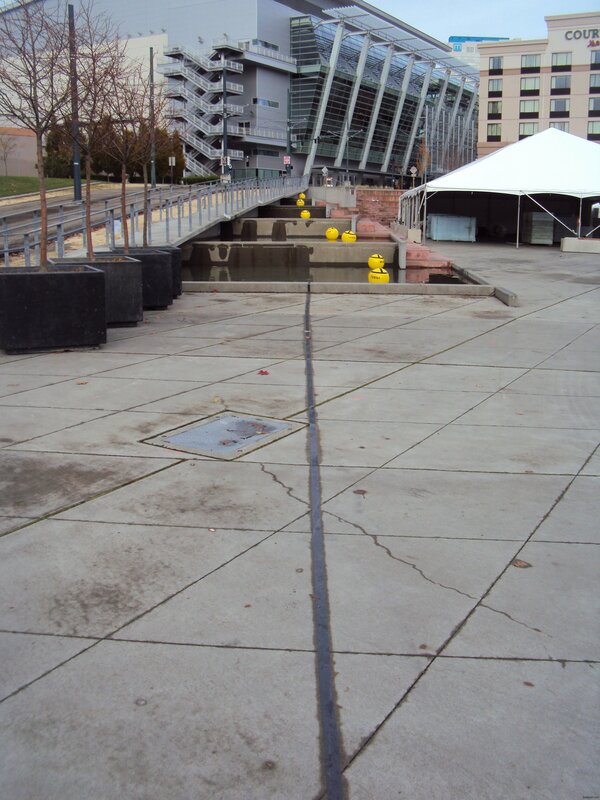 The “Link” installation creates a visual site line between Tollefson Plaza and the other temporary installations at Site #3 (BNSF street crossing) and the UWT campus (Thoughtbarn site & Site #5, UWT pedestrian bridge).